Healing Your Marriage When Trust Is Broken. 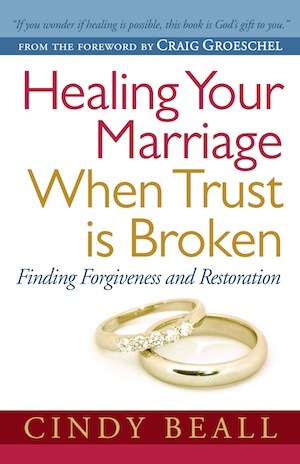 And, those are the first words my good friend, Cindy Beall, pens in her book, Healing Your Marriage When Trust is Broken. I know Cindy and her husband, Chris. I’ve sat around their dinner table. I’ve eaten Cindy’s amazing black bean salsa and steak fajitas. I’ve spent hours shopping with her helping her pick out the perfect pair of denim. ‘Cause she is understands a good pair of jeans is from the Lord. So, what I’m saying is….I know her story. And, it’s the most amazing story of redemption in a marriage I’ve ever personally known. But, it’s one thing to know her story. It’s another thing to read it. To read the brutal transparency of what her heart looked like after Chris confessed he had been unfaithful. To read the shock. The betrayal. The shattered dream. And, then to read the forgiveness. The healing. The restoration. The marriage that God made better than new. If you think your marriage is unrecoverable. If you wonder if you will ever be able to trust again. If you have lost all hope…. Cindy’s book will inspire you to believe otherwise. She will win your heart with her honesty. And, she will help you write your own story of redemption. To purchase Cindy’s book, go to Amazon.com. I’m going to take a day or three off from the blog to take care of my youngins. John Henry has pneumonia, so prayers are always appreciated. We are not worried, because we know Who is in control. And, God loves him more than I do. So, holla! James 5:16 tells us to “pray for one another, so that you may be healed.” So, if you’d like, leave a prayer request in the comment section of the post. I’ll pray for you, and we can all pray for one another. Cool? Your comments go directly to my e-mail which goes directly to my nifty iPhone which rarely leaves my side. You’ll be in my thoughts. And, I know John Henry will be in yours. Living with a chronic disease. My senior year of college was a stressful one. I over-loaded on classes for the single goal of finishing school a year early. Silly girl. What was I thinking? It was during this time that I was diagnosed with an incurable, but usually manageable disease. I will spare you the details. Believe me, there is nothing glamorous about it. · I have no idea what that other mom at the mall is facing. My life is possibly much easier. · These are the cards I’ve been dealt. It could be worse. · When I focus on my disease, I don’t focus on what’s really important. · I can choose to walk in healing every day. And, I speak it over my life. Our words are powerful, remember? · I know my worst case scenarios. I will still survive. · God is bigger than my frailties. · I take the meds….even when I don’t want to. It’s not just about me. I’ve got a family who needs me around. The biggest lesson learned has been to not focus on my disease. This doesn’t mean that I ignore it, or let it go untreated. But, I don’t let it consume me. The enemy – and there is one – wants us to take our focus off of others and place it on ourselves. When we focus on ourselves, we are unable to do the things our Savior has called us to do. And, He has called us all to live beyond ourselves. So, when I’m struggling with my disease, I submit it to my prayer warriors. And, they pray! Scripture tells us that the Lord is our physician. (Exodus 15:26) And, His medicine is His Word. No matter your struggle – heart, soul or body – we serve the great physician, a life-giver, a healer. He has plans to prosper you, not to harm you. A plan for a life and a future. For those in the middle of a battle right now, here is my prayer for you. So, tell the enemy to put that in his pipe and smoke it.